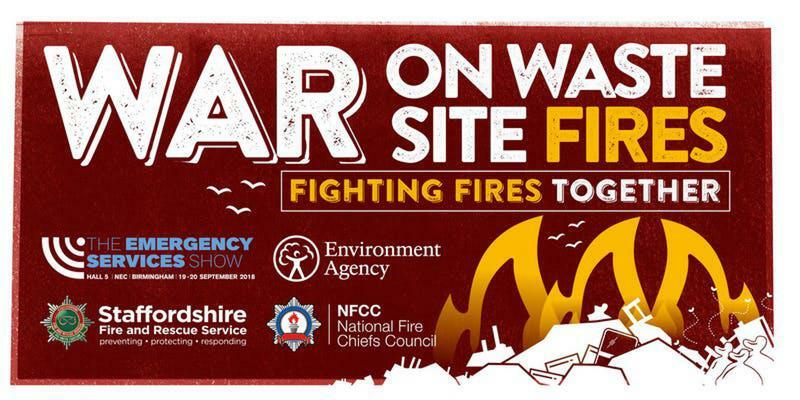 Organised by Staffordshire Fire and Rescue Service and supported by the Environment Agency and National Fire Chiefs Council, the War on Waste Site Fires conference is an opportunity to share information and expertise between those who respond to and deal with waste sites fires. Speakers include fire and rescue services, local authorities, Public Health England and the Environment Agency. There will be a chance at the end of the conference for a facilitated discussion to share best practice and discuss opportunities for collaboration. The full programme can be viewed here. The conference is taking place during The Emergency Services Shows 2018 in Hall 5 at the NEC, Birmingham so conference delegates can therefore combine a visit to the show with a two-hour conference session. Both events are free to attendees and there is free parking at the venue as well. Illegal and unlicensed waste sites pose significant fire risks and when fires do occur, the resulting firefighting conditions are often complex and arduous, requiring a huge number of resources and close multi-agency co-ordination to minimise the impact on local residents and the environment. In the last two years emergency services and partners, with the experience of the challenges of these waste sites, have worked together locally and nationally to increase technical expertise surrounding the prevention, mitigation and response to waste site fires. Progress has been made within professional work areas such as technical firefighting, the development of expertise in the form of a waste Tactical Advisor course and in sharing intelligence. There is still, however, a lot more work to do on this issue.